Photo by Mark Winslett, Bastrop Stories. In order to help everyone stay updated on the Hidden Pines Fire, we compiled a resource list including where to find updates and how you can help. If you have anything to add to the list or find any errors, please email us here or comment below. CodeRED Community Notification Enrollment - an emergency notification service that allows you to receive messages (like evacuation notices) from your local municipality or employer that are pre-recorded and sent to your phone and/or email address. I highly suggest you register with this service! CAPCOG Regional Notification System - a 10-county notification system managed by the Capital Area Council of Governments that uses a "reverse dialing" method to notify residents of critical emergency information by phone (land-line or cell) or text. 10-county region includes: Bastrop, Blanco, Burnet, Caldwell, Fayette, Hays, Lee, Llano, Travis, and Williamson counties. 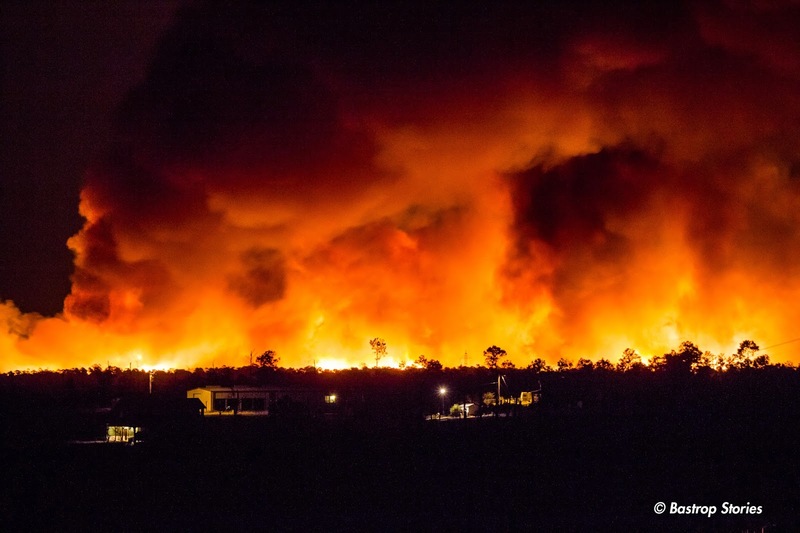 Dispatch Tracker - a service from the Texas A&M Forest Service with updates on forest fires in Texas, including number of acres burned, percent contained, homes threatened/lost, etc. WunderMap - Interactive map that shows the locations of the fires, including smoke cover. Hidden Pines Fire Evac Area & Shelters - Map marked with evacuation areas and shelter locations. Fire Data in Google Earth - Interactive map First, you must download Google Earth (the free version works fine), then go to the Fire Data in Google Earth website, click on "Fire Detections (MODIS) - Current" and then choose "Open" to see the map with the current fire data. ArcGIS US Wildfire Activity - Interactive map continuously updated with data about US wildfire locations, fire potential areas, meteorological observations and radar imagery. GeoMAC Wildfire Viewer - Interactive map that shows MODIS thermal satellite data. Along the Rado - Map marked with evacuation areas and shelter locations. Draft Logic Distance Calculator - Calculate exactly how far are you from the fire. Prosperity Bank in Smithville - Accepting monetary donations. Please make checks payable to EITHER Smithville Volunteer Fire Department OR Smithville Ministerial Alliance. Anyone at the counter will be able to help you, or you may call (512) 237-9649. Located at 406 Main Street in Smithville. Bastrop County Long Term Recovery Team - Accepting monetary donations and gift cards. BCLTRT will be assisting with immediate needs, cleanup, and recovery. Donations can be made online at www.bcltrt.org or mailed to BCLTRT at P.O. Box 1975, Bastrop, TX 78602. Located at 1106 College Street, Ste. E-8 in Bastrop. Heart of the Pines Volunteer Fire Department - Accepting monetary donations. Heart of the Pines VFD is not tied into a tax base, but they are working tirelessly to help put out the Hidden Pines Fire, which is taking a huge toll on their finances. They desperately need funds for truck repairs, hoses that have been damaged to the point of having to be replaced, and a multitude of other expenses. Please make checks payable to "Heart of the Pines VFD" and mail to: PO Box 98, Smithville, TX 78957. Catholic Charities of Central Texas - Accepting monetary donations. CCCTX will be assisting with immediate and long-term needs, such as gift cards, mental health services and disaster related emergency financial assistance. Donations can be made online at www.ccctx.org/donate or mailed to 1625 Rutherford Lane, Austin, TX 78754. 100% of donations go directly to Disaster Response, with no portion going to administrative fees. Bryan & Claire Turner - Bryan, Claire, and their 10-month old daughter lost their home in the Hidden Pines Fire. Bryan serves as Director of Summer Camps and Marketing at Camp Wilderness Ridge, which is where they lived. *This Go Fund Me account has been fully vetted by 365 Bastrop as legitimate. Jeremy & Lindsey Thomasson - Jeremy, Lindsey, and their infant son lost their home in the Hidden Pines Fire. Jeremy serves as Director of Retreats and Camping and Lindsey serves as Food Service Manager at Camp Wilderness Ridge, which is where they lived. *This Go Fund Me account has been fully vetted by 365 Bastrop as legitimate. Charlie & Beth Parrish - Charlie and Beth lost their home in the Hidden Pines Fire. Charlie is a stunt man/actor and runs a self-defense class for women. Beth is the owner of Inspired Riding, and teaches riding lessons. You can donate to their Go Fund Me account, mail donations to them at: PO Box 697 Smithville, TX 78957, or you can gift funds directly to them via PayPal using the email address: inspiredriding@gmail.com. *This Go Fund Me account has been fully vetted by 365 Bastrop as legitimate. Crea Parson - Crea and her 15-year old daughter Lilly lost their home in the Hidden Pines Fire. Crea is a single mother and could use as much help as she can get. *This Go Fund Me account has been fully vetted by 365 Bastrop as legitimate. Camp Wilderness Ridge - Camp Wilderness Ridge is an independent, non-denominational Christian summer camp and retreat center. They lost most of their structures in the Hidden Pines Fire, including the homes of several of their full-time staff. You can donate to the CWR General Fund, the Building & Special Projects Fund, or any of the full-time staff (including the Turners and/or the Thomassons). Bastrop County Long Term Recovery Team - BCLTRT will be assisting with immediate needs, cleanup, and recovery. Call (512) 521-3001 to volunteer. They're located at 1106 College Street, Ste. E-8 in Bastrop. They are also accepting monetary donations and gift cards. Donations can be made online at www.bcltrt.org or mailed to BCLTRT at P.O. Box 1975, Bastrop, TX 78602. Mission U-Too - Volunteers are needed to help cook food and to deliver the food to those who need it, especially those with larger vehicles like SUVs or vans. Volunteers should report to the Smithville Rec Center located at 206 Royston Street in Smithville. Contact Jason Bray at (214) 236-4446 or Jonah Beyer at (512) 988-8365 if you have any questions about volunteering. Hidden Pines Fires Help for Animals - Facebook page for people with animals in need of help evacuating and those who can offer such help. Bastrop Livestock Show Barn - Located behind the American Legion at Loop 150 and Legion Drive in Bastrop. This is the official livestock supply point and animal evacuation site for Bastrop County. Donations needed: feed for livestock, water troughs, feed buckets and pans, round bales, and square bales of hay. Contact Rachel Bauer for more information at (512) 468-7953. Bastrop County Animal Shelter - They are taking in pets for people evacuating the fire. Donations needed: dry dog food (Purina ONE or better), dry Friskies cat food, canned Friskies (or better), paté style cat food, stainless non-tipping food and water bowls, wire crates (all sizes), cat litter pans and cat litter, dog leashes, clean old towels and blankets. Donations can also be dropped off at the UPS Store #6667, located at 489 Agnes Street in Bastrop. Bastrop Animal Rescue, Inc. - They are raising funds to help with evacuated and displaced pets. Williamson County Sheriff's Posse - Accepting donations of hay, feed and buckets for evacuated/displaced animals in the Bastrop area. Donations can be dropped off at the Posse Arena, located at 415 E. Morrow Street in Georgetown. Austin Pets Alive - Accepting donations for the Bastrop County Animal Shelter including Bleach, Clorox Wipes and Paper Towels. Located at 1156 W. Cesar Chavez in Austin. Austin Disaster Relief Network & American Red Cross - Displaced Family Services will be offered at the Smithville Rec Center, located at 206 Royston Street in Smithville. Clothing vouchers, emergency financial assistance, spiritual/emotional care, and long term family care will be offered at no cost to those displaced. Bastrop County Long Term Recovery Team - Evacuees and families with confirmed home loss should register with the BCLTRT. They will also be at the Smithville Rec Center. Born Again Emporium - Clothing vouchers and personal hygiene items. Located in the lobby of the Smithville Rec Center. Catholic Charities of Central Texas - Gift cards, pharmacy assistance, eye glass replacement, and emergency financial aid. Located in the gym of the Smithville Rec Center. Bluebonnet Trails Community Services - Crisis counseling, stress management techniques, and emotional support. Located in the gym of the Smithville Rec Center. Mission U-Too - Providing meals and snacks in the kitchen of the Smithville Rec Center. State Bar of Texas - A free hotline has been setup at 1-800-504-7030. They will answer any basic legal questions, from what to do about insurance/no insurance, utilities, auto claims, pets, etc. Due to the Hidden Pines Fire, Bastrop County was added to the FEMA Disaster Declaration List yesterday, Oct. 14, 2015. Disaster assistance for homeowners and renters may include grants to help pay for rent, temporary housing and home repairs, as well as other serious disaster-related needs, such as medical and dental expenses or funeral and burial costs. For more information, click here. Thank you, Arielle! That's a great resource. I'll add it to the list. I believe the Dispatch Tracker is not working. Still has the 10/13/15 info and today is 10/15/15. Hmmm... that's weird. Maybe they haven't had time to update it? The date is referring to the date/time the incident started. I know it's a little confusing. Oh, good! Thank you so much for the clarification, Ralph. You're welcome! And thank you for the great info page y'all have but together.